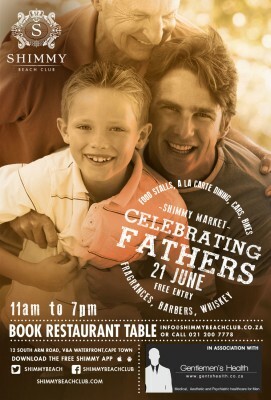 To celebrate Fathers Day, Shimmy Beach Club will have a Market day for men with a variety of stalls and products. Cape Town’s premier venue is host to the event, in association with Gentlemen’s Health, providing medical, aesthetic and psychiatric healthcare for men. Expect to find food stalls, whiskey tasting, cooking demonstrations, men’s fragrances, as well as cars and motor bikes on display. All stalls and suppliers offer something of interest to the modern man such as clothes, traditional barbers, craft cider or whiskey tasting or sports supplements. 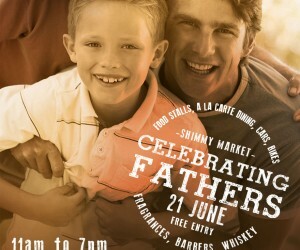 Shimmy will also offer pizza, sushi and coffee classes to Dads and kids, with a certificate on completion. An la carte menu is also available in the Shimmy Restaurant, with delicious choices from a new winter menu. Alternatively, choose from the delicious pizza options, or order a gorgeous, fresh sushi platter, with fine wines. Dedicated au pairs will supervise children, while parents and grandparents enjoy the day. It’s the ideal way to spend this Father’s Day with friends and family overlooking scenic views of the Atlantic Ocean and boats sailing through the harbour. To book a restaurant table, simply email info@shimmybeachclub.co.za or call 021 200 7778. You can also book via the Shimmy App. Visit www.Shimmybeachclub.com for more information.